Writing letters of complaint only works when you’re somebody important, when your problem is universal, or when it has the potential, I suppose, of generating a large, class-action suit. Somehow I knew that my letter to the Director of the Peace Corps had zero chance of doing anything, and why not? Unless you’re Jimmy Carter’s mother, a Peace Corps Volunteer is about the last person on the world’s ‘important’ list and the problems of ordinary Jamaicans, admittedly, are hardly that universal, though at least there’s an argument to be made on that point. In any case, I can’t see Peace Corps volunteers suing the government for negligence or even more money, so that made three strikes against me. Naturally after a while, I found myself asking “why should I care?” After all, by that time I was out of the Draft and as the Board’s secretary had so fatefully informed me during a phone call I’d made to check on my status, I could go on with the rest of my life. You can imagine the effect of that statement. Indeed, but then, what was the Peace Corps supposed to be for anyway? Why had I joined? With less than a dozen volunteers in the Guidance component and about the same number of parishes on the island, it had been decided that each volunteer would be assigned a particular parish. How they chose who should go where, I have no idea. In my case, as our small group’s long training period finally drew to a close, I found myself assigned to what I would eventually learn was commonly accepted as one of the most individualistic, nationalistic, and consequently ‘hostile-to-whites and foreigners’ parish on the island – that being St. Thomas. That particular parish was located along the south coast, east of St. Andrew and Kingston itself and apparently there’d been no volunteer there in my group at least for a few years, if ever. Why not, I was never told but soon guessed. Not to be too pessimistic, I finally had to conclude that what the agency thought a volunteer could actually do there, except for hiding out until his or her two year period of service was over, I had no idea. In fact, to a certain extent, my entire adventure there was like that from the start. I remember this one afternoon our group’s immediate, in-country supervisor had packed a few of us up in her car and started out early in the morning heading for St. Ann and Ocho Rios over the mountains. She was an intelligent and lovely young woman, as it happened, though she wasn’t Jamaican but instead came from Trinidad. I was never really quite sure how that worked, but I guessed that her attachment to the Ministry was by way of serving a out period of obligation she’d accepted as part of payment for an overseas education through an agreement with the University of the West Indies. Her plan that day was to continue around the eastern end of the island to several little villages in St. Mary, Portland and finally St. Thomas. She’d wanted to get back to Kingston by nightfall.This was the first week of contact with the actual place we were to spend our two years of service and the idea was to spend a week with our intended, host families and see how things went. I remember I was the last to be dropped off, so I was in the car all day long. The trip was fast and grueling, but the supervisor was a good driver and I felt comfortable about it and enjoyed myself, sitting in the back seat and watching my fellow trainees meet their families one by one. 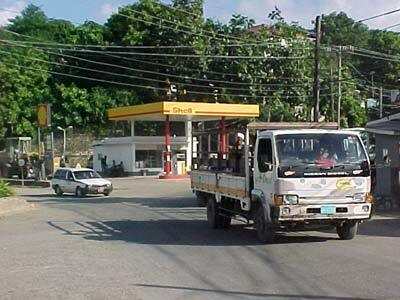 to be dropped off would come somewhere on a road inland from Morant Bay about an hour out from Kingston. Everything seemed to be going well and on schedule and somewhat late in the day we finally got to the place I was to stay. It was a small house, the lawn and shrubs nicely kept, just off a main road and a few miles inland from Morant Bay. The family was a young couple in their thirties with only one child. They both worked and were fairly well off, the man in Kingston, and the woman in the area. They were both home on weekends with their young child.Upon our arrival, my supervisor excused herself and went in to make final arrangements for my stay. It was something I mistakenly assumed had already been done, but actually hadn’t. While she was inside chatting, back out in the car, I suddenly found myself feeling a little ill. In fact, I was getting sick, very sick, and I somehow I knew it wasn’t just car sickness from riding all day. It seems there’d been some mix-up with the dates or something, but in any case, when she came back to the car she couldn’t help but notice my worsening condition and asked me if I was alright. I told her I wasn’t sure, but that my stomach was giving me sharp pains that were coming in waves. Apparently I’d eaten something that morning or the night before which hadn’t agreed with me. Maybe it was just indigestion, as she suggested. Then, before I could get out of the car, I passed out, falling forward across the dashboard and sliding down face forward to the floor. When I woke up, the two of us were on the road again on our way to Kingston and in a big hurry. She’d toId me I was being taken to the Peace Corps doctor in an office near the Oxford Pharmacy on Half-way Tree Road. The office itself was just behind the buildings the Peace Corps were using for training purposes at Mico Teacher’s College. I knew where it was because I’d attended various meetings there during my own training. It was also the place where various other components were barracked during their first few weeks on the island.For the next hour or so, riding along in the car, I had come to, then passed out again, and done that several more times before we finally arrived. Each time I did, the pain was getting worse. You know, I have to admit, I was getting a little worried at that point. Without immediate care, she said, I stood the chance of falling into a comma within a few hours. It was that serious, she’d said. In fact, it could’ve even been fatal without proper treatment, especially since I was not used to the island’s food and had built up no natural immunity to the various bacteria found there. She gave me a shot of morphine for the pain, one of penicillin to fight off the infection, and one of vitamins to help me keep up my strength. She’d handed me a prescription for more antibiotics and said I should get it filled that afternoon at the Pharmacy. Where was I going to go to sleep?, she asked and then told me that because of the morphine’s effect, I had only a few minutes to stay awake. “Where is my supervisor, the woman who’d brought me here?,” I wondered aloud. “Oh, she left,” the doctor said. Apparently she’d something else more important to do that afternoon. With the office of the Peace Corps’ training facility not far away, just behind the Pharmacy, I could probably make it there, I told her, and she immediately instructed me to do so in a hurry, before I fell asleep.Down the stairs I walked briskly, prescription in hand, being fearless as usual. The effects of the morphine however were coming and coming all-too-quickly. I began to feel all warm and fuzzy and a little uncertain of my footing so I walked faster to try to compensate.Beside the building, there was an empty lot and at the far edge a long, wooden plank about a foot wide that stretched out all the way across a drainage viaduct, now empty of flood water that time of year except for the usual scattering of little pools of rainwater, tree branches and of course, the usual litter. I stepped out onto the plank, as I recall, holding my arms out wide to keep my balance. I could make it I was sure, I told myself confidently. There in the distance I could see the open door of the main administrative office, out across a field on the other side of the viaduct. Somehow I made it across the chasm without falling in, but as I crossed out onto the grassy expanse, I noticed a statue of the Virgin Mary standing in what looked like a fountain. For some reason, the field was getting wider and the buildings further away. Out in front of me there was now a sea of beautiful yellow, butter cups, rolling gently in the wind. “When I find myself in times of trouble, Mother Mary comes to me, speaking words of wisdom, let it be, let it be.” The rushes came stronger and in dizzying waves. I tried to fight them off as best I could, but the butter cups were in my face and the Lady was getting closer and for some reason I just couldn’t reach her. That Beatles song had come to mind, instinctively, I suppose, with great emotion. Tears of joy were falling all the while… “and in my hour of darkness, she is standing there in front of me, singing words of wisdom, let it be, let it be…” And so she was. That’s about all I remember. They told me later that the Peace Corps Director was standing in that small office, there at a blackboard, giving some sort of explanation to a handful of his officers. At that point, this young male volunteer came staggering in, note in hand, walked right up to him without introduction or apology for the interruption and said “this afternoon,” passing out, right in his arms. When I awoke, I was upstairs in the dormitory, no clothes on under a white sheet in a bed with a dozen other empty ones around me. There looking down at me were three, beautiful young women. Thirty-something hours had gone by since I’d fallen asleep from the morphine! As I came slowly back to my senses, the first I thought I had was that I must’ve died and that the three faces looking down upon me were angels. Then I realized they were Peace Corps volunteers I knew and that finally my ordeal was over. A week or so later, when I’d fully recovered, I arrived again at my host family’s house and began my first, in-country week of acclimation to St. Thomas. 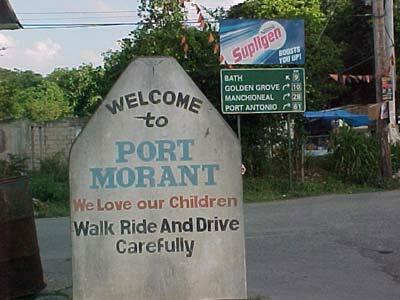 After spending a few days in the parish, driving around in an old Morris Oxford the family had loaned me and being called “pork” and “hippie boy” for the first time in my stay, I walked along the streets of Morant Bay and was treated with general disdain and visible contempt. I began to have great doubts about staying there and doing anything beneficial. There was just something tough and uninviting about the place.